I have always loved Greece and anything remotely Greek – Greek mythology, poetry, architecture, heck, even Grecian-style dresses. In fact, Greece ranks somewhere in my top three places to visit before I die. So naturally, I was dying to try out Greek restos here in Manila. Which was something I was not to get until last week. Ipe, huge appetite notwithstanding, is not really adventurous when it comes to food. He eats the same things over and over again but last week, he finally gave in when I suggested we try Cyma at Trinoma (I think he was forced to agree, since the mall was jampacked with the salary weekend crowd and Cyma was one of the few places where you can still get decent seats). First off, we decided on Htipiti, a tart feta bread with spicy cream cheese dip.The word literally means “that which is beaten” apparently because to make this bread, you have to keep beating it to make it more tarty. Anyhow, the taste was marvellous – the spicy dip was the perfect foil for the bread. Ipe and I had to stop from stuffing ourselves full before all our food were served. I think the dip came with six or seven feta bread which was filling enough on its own. I’ve always loved cream cheese but never thought of serving it with chili so this was really nice. 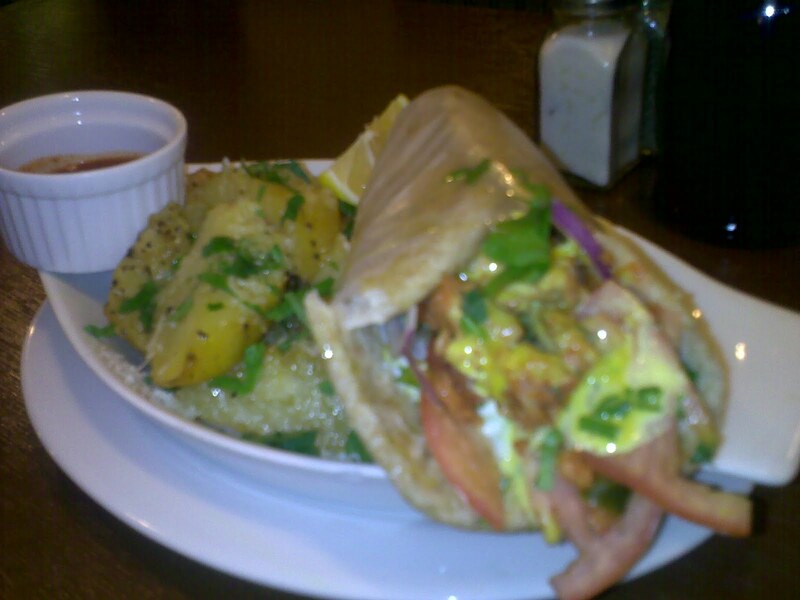 Up next, we had a chicken gyro and greek potatoes, which we split into two since it was quite too big for one person. Gyro is a type of sandwich consisting of meat, tomato, onion served on a pita bread. In our case, meat was chicken. It seemed somewhat a variation of the hero sandwich, except that it is much tastier, owing to the presence of various sauces and the slices of tomato and onions. I was so preoccupied with the gyro though, I forgot to taste the potato. Finally, Ipe and I turned out tastebuds to the moussaka, which if I am not mistaken, is some sort of national dish in Greece. It consisted of eggplant with minced meat and melted cheese on top. I admit I am an eggplant person (personally, my favorite veggie meal is the tortang talong – if I had my way at home, this would be served on a daily basis) so this one is just pure heaven – I was getting my eggplant fix AND my cheese! How’s that for a meal? Needless to say, I am now a certified Greek food fan. And Cyma’s offering are quite cheap – htipiti is only Php 180, gyros at Php 160, potatoes at Php 100, and the moussaka at Php 250. 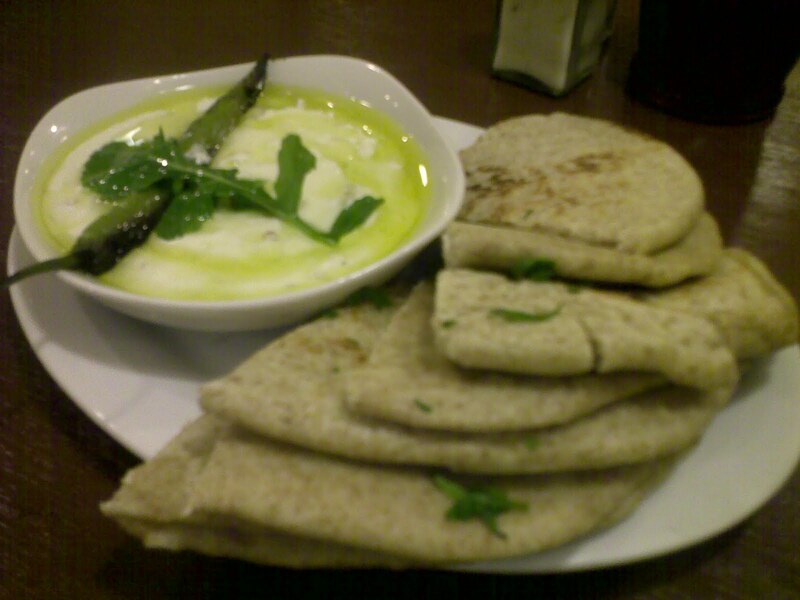 PS: Check out Cyma at http://www.cymarestaurants.com/. Menu/prices are also available on their website. I went there for the first time when I was in Manila last April. Twas good. And those waiters who yell “OPA!” when they serve those flaming cheeses are really fun to watch.